Doing lunges is a great way to develop your thigh muscles, promote hip stability and boost your athletic performance because this exercise engages all the muscles in the leg and makes them go through a very wide range of motion. Although bodyweight lunges work great for toning up your thighs and quads, if you’re a lifter looking to add serious mass to his lower body, you should consider adding some extra load to really challenge those leg muscles into growing stronger and bigger. Performed with a barbell, the walking lunge can be one of the most powerful tools in your leg building arsenal, as long as you know how to do it properly. Here are 4 common mistakes that reduce the effectiveness of this great exercise and how to fix them. By doing this, you place undue stress on your lower back and take off tension from your glutes and quads. To avoid that, concentrate on pushing your chest out so that your torso stays perpendicular to the floor, and keep your eyes facing forward. Your posture should remain upright and your lower back naturally arched all through the motion. As in other exercises which aim to engage the posterior chain muscles, you need to push through the heel and not through the toes. Pushing through the toes will focus the movement on the knees and quads only and prevent you from training the entire leg. 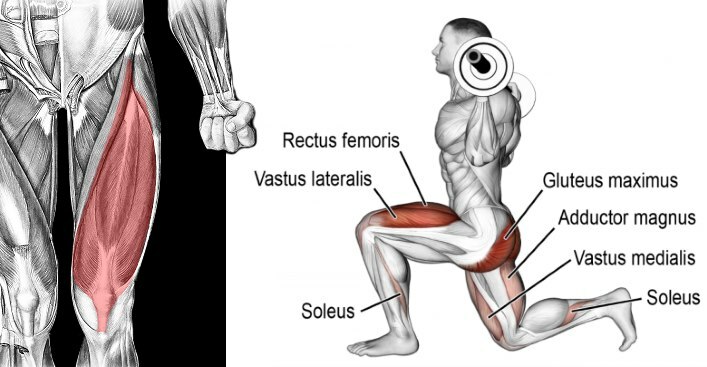 Taking small steps while lunging causes your knees to travel over the toes at the bottom of each rep, which hinders proper muscular balance of the complete leg musculature and can lead to knee pain and injury in the long run, so make sure to step out far enough so that your heel hits the floor first. Flex the knees to drop your hips and descend until your rear knee nearly touches the ground. The front knee should always point in the same direction as the front foot. When you have a barbell resting across your back, you need to move at a moderate pace and focus on maintaining your form as strict as possible. Moving too fast won’t give you any additional benefits – it will make your form sloppy and increase your risk of injury. 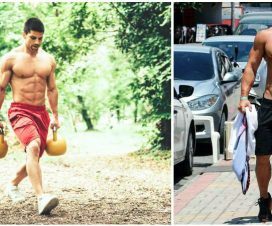 Barbell lunges train your legs in a very functional manner and can greatly improve your stability, balance and muscular coordination, so in order to get best results you need to take it slow and focus on the contraction. To master this exercise, perform it two or three times per week and keep your form perfect. Form comes before weight – especially in complex skill movements like this. Stick to the lower rep range and emphasize the mind-muscle connection. After a few weeks, you should be able to see noticeable improvements in lower body strength, balance and coordination. Hi sir, I’hv suffering from. Lover disc issue (L4) incident occurred Iin 2015 now I hv recover a lot, I hv started doing exercises – legs exercise, ( biseps, bench chest, arms, shoulder and triceps) what precautions should I need to take..